Epinephrine is a lifesaving medicine for people with severe allergies. It is important to discuss with your doctor about what is the most appropriate prescription for your family. You may also need to find out which options your insurance provider prefers. This will affect your out-of-pocket costs. Each device has its own unique set of instructions. Understanding those differences is important so that you get the device you want and you know how to use it. Pharmacists must follow state and federal regulations when filling your prescription for epinephrine. You should keep this in mind when filling your prescription. 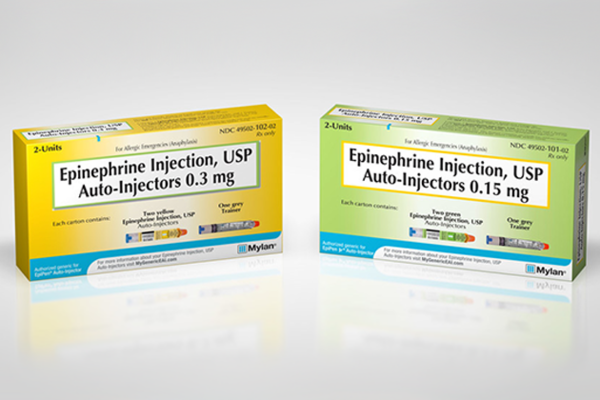 Epinephrine injection, USP auto-injector, made by Lineage Therapeutics, is the authorized generic of Adrenaclick®. It is available in a package of two injectors. Trainers are available upon request. Lineage Therapeutics offers a co-pay coupon card. Watch the training video for Lineage's Epinephrine injection, USP auto-injector. 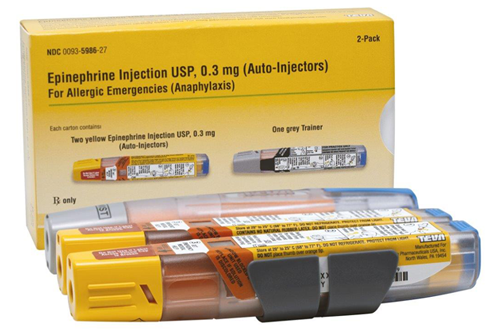 In addition, CVS Health is selling these generic epinephrine auto-injectors at all CVS Pharmacy locations at a cash price of $109.99 for a two-pack. UPDATE: New Dose for Infants and Small Children: Kaleo's 0.1 mg AUVI-Q auto-injector for infants and small children 16.5 to 33 pounds is available as of May 1, 2018. 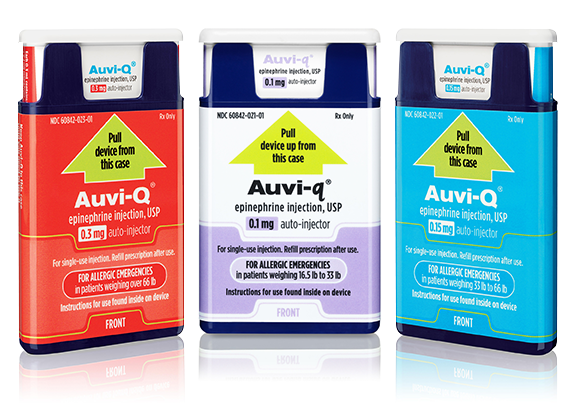 UPDATE: The November 2017 update to the AUVI-Q (epinephrine injection, USP) label included a change in hold time from 5 seconds to 2 seconds. Kaléo is offering discounts through its AUVI-Q AffordAbility™ program. AUVI-Q is available free of charge to patients with a household income of less than $100,000 who do not have government or commercial prescription drug coverage. The company said those with commercial insurance, including those with high-deductible plans, will be able to obtain AUVI-Q for $0 out-of-pocket. Kaléo said the $0 out-of-pocket cost will also apply to those whose insurance will not cover the cost of AUVI-Q. Order directly from Kaléo by giving the enrollment form to your doctor. Call 1-877-30-AUVI-Q for questions about eligibility. Watch the training video for Kaléo's AUVI-Q epinephrine auto-injector. UPDATE: The FDA extended the dates of certain lots of EpiPens in August 2018. See if your EpiPens are included in the extension. 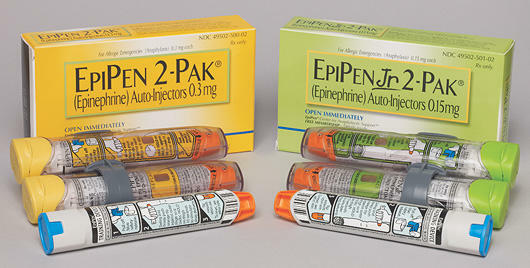 EpiPen® and EpiPen Jr® made by Mylan, come as a two-pack with a trainer. Mylan offers a co-pay coupon card to reduce out-of-pocket expenses up to a maximum of $300 per EpiPen 2-Pak® prescription. The card remains valid for up to six two-packs per year. Mylan also offers a patient assistance program for patients who meet their eligibility requirements. Watch the training video for EpiPen® and EpiPen Jr®. Epinephrine injection, USP auto-injector, made by Mylan, is the first authorized generic (AG) for EpiPen®. To save on this version, get the MyGenericEAI Savings Card for a savings of $25 for the generic epinephrine auto-injector. Watch the training video for Mylan's Epinephrine injection, USP auto-injector. Teva Pharmaceutical Industries received FDA approval in 2018 to create another generic version of the EpiPen®. As of November 2018, it is available in limited supply in the U.S. in the 0.3 mg dose. A larger supply of the auto-injector, as well as the 0.15 mg version, is expected to be available in 2019. Teva offers a savings card for up to $30 off a two-pack with commercial insurance. It is good for three cartons per prescription. Watch the training video for Teva's epinephrine auto-injector. INSYS Therapeutics received Fast Track Status from the FDA for their epinephrine nasal spray in August 2018. Oval Medical is testing a new, compact auto-injector that may enter the UK market in 2019. Windgap Medical is also designing a new, compact auto-injector. They anticipate submitting it for FDA consideration in 2018. Was your child diagnosed with a food allergies? The adjustment to living with food allergies can be overwhelming. Learn what parents need to know about managing food allergies and download our free guide. Connect with other parents who can help you through the learning curve. Originally published September 2016. Updated January 2017, February 2018 and December 2018. 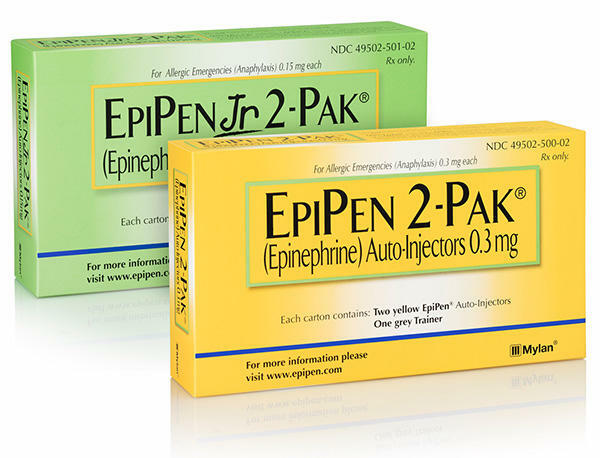 This blog post was updated in December 2018 to include information on the generic epinephrine auto-injector from Teva Pharmaceutical Industries and the nasal spray from INSYS Therapeutics.